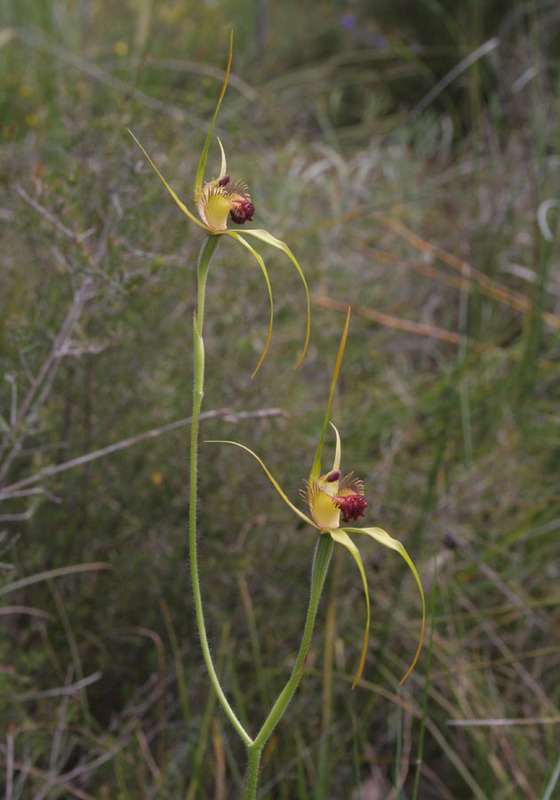 This group contains 4 similar species. 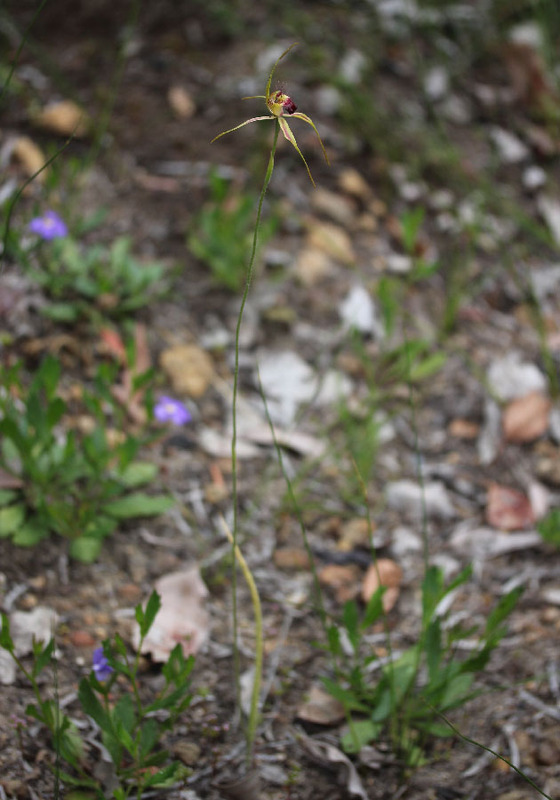 All have large showy flowers on tall stems. 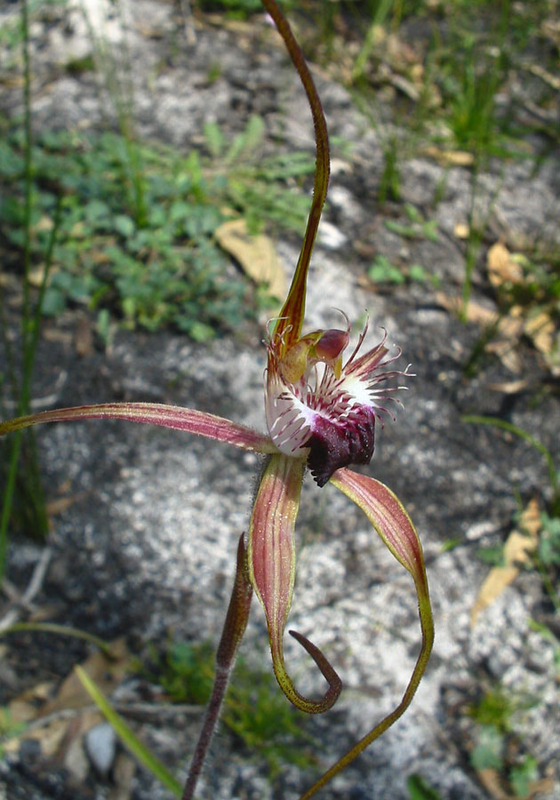 The King Spider Orchid is the most common species in this group. 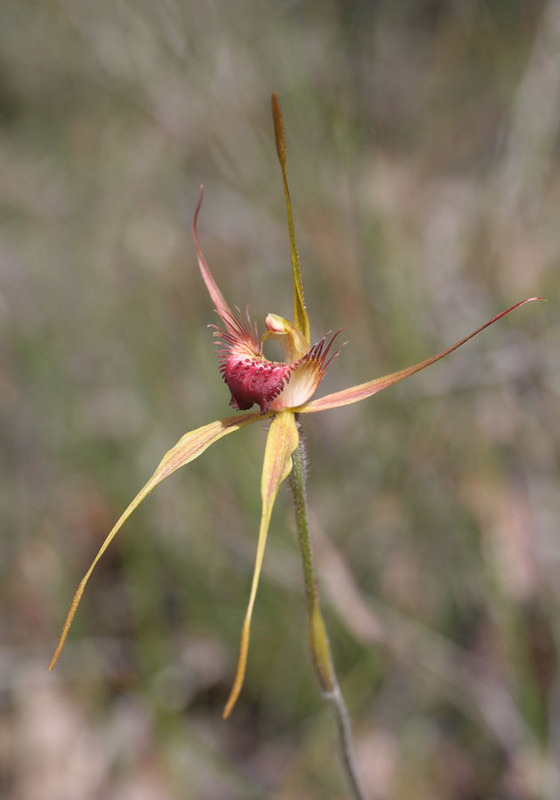 It is found from Perth to Albany in a variety of habitats. 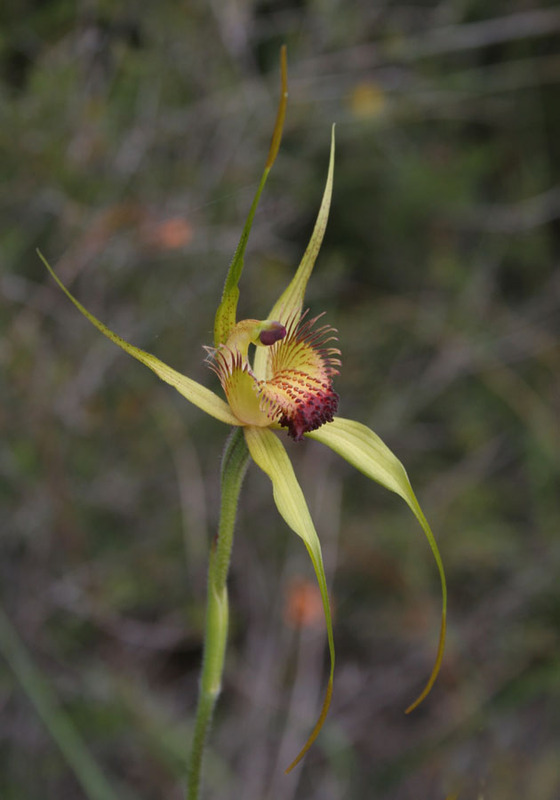 It is easily distinguished by the way it holds its petals, with two held stiffly upwards. 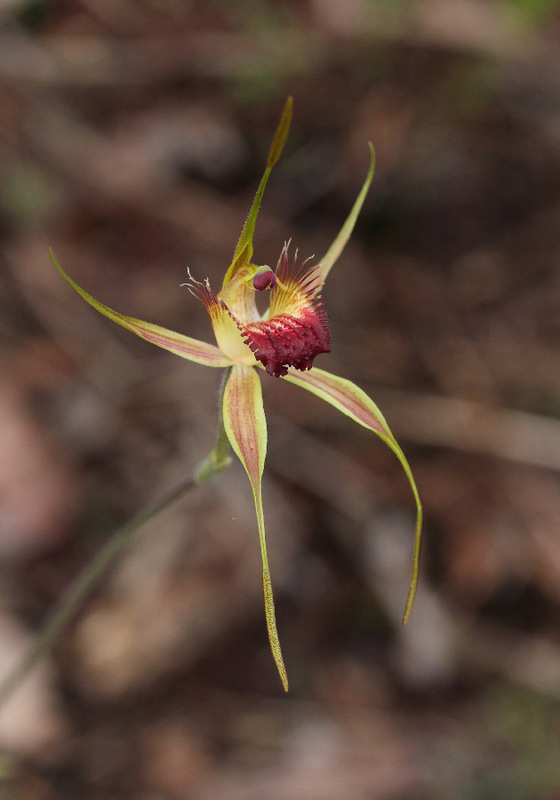 It is quite variable in colour with petals and sepals ranging from pale orange to deep red. 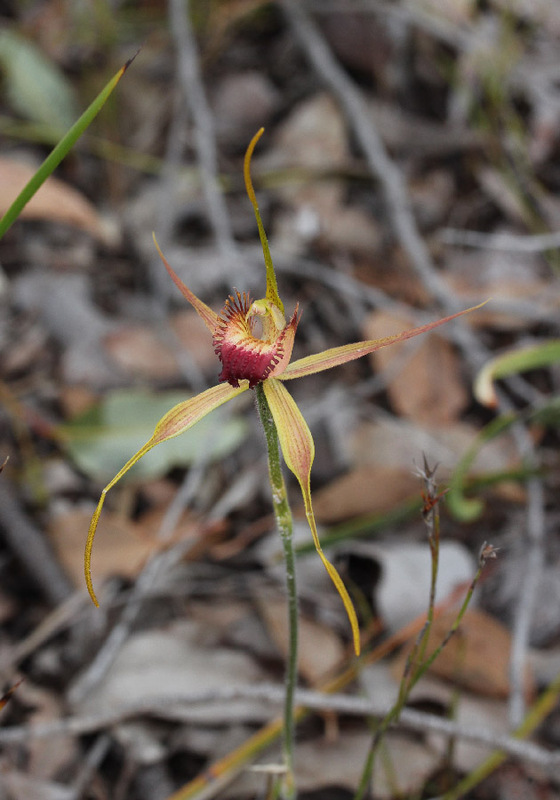 Plants found in the south-eastern areas of its range tend to be more colourful. 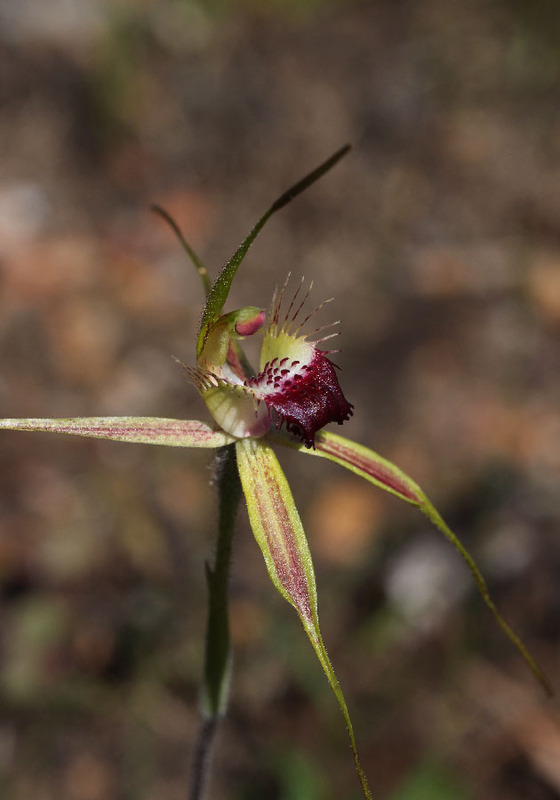 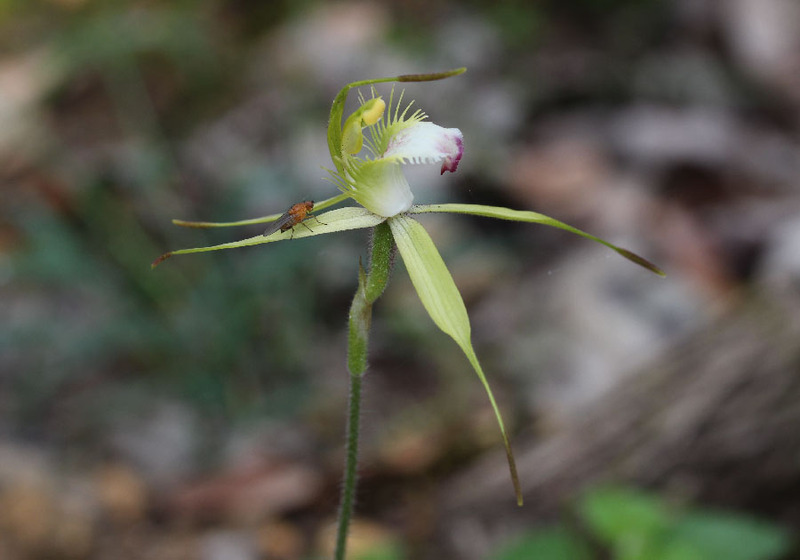 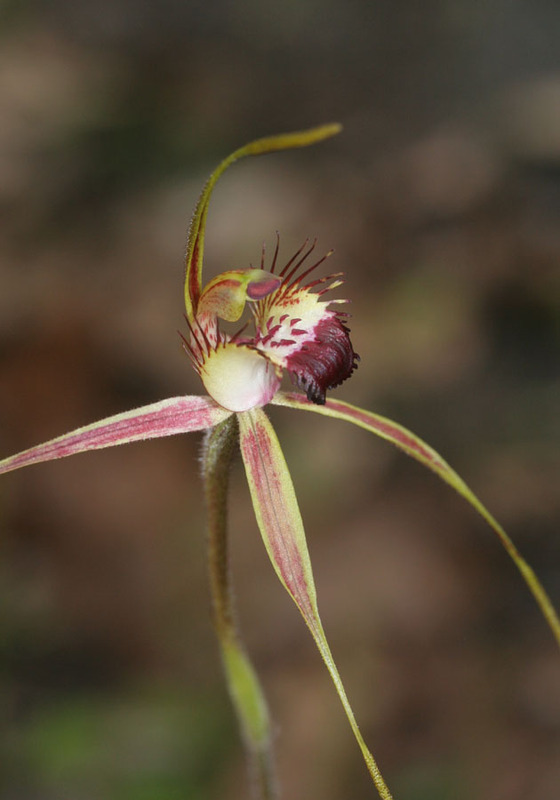 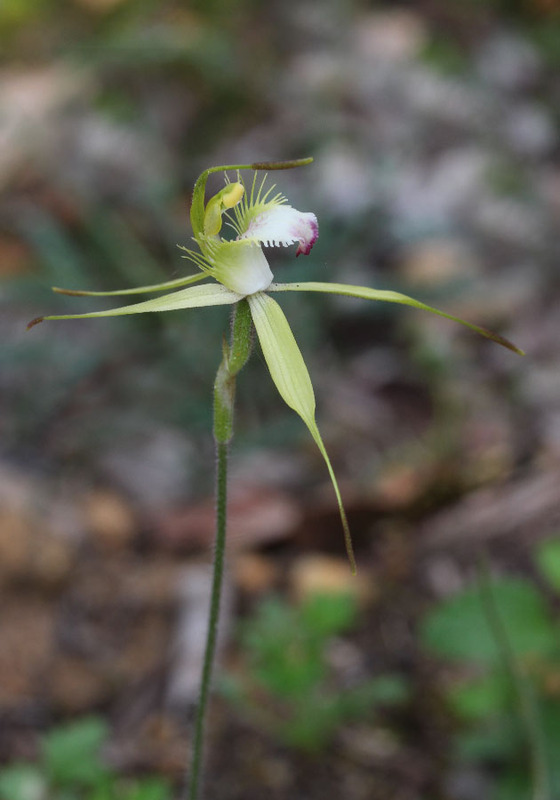 The Heberle's Spider Orchid looks a lot like hybrids between the King and White Spider Orchids, but is found in areas where the parent species are not. 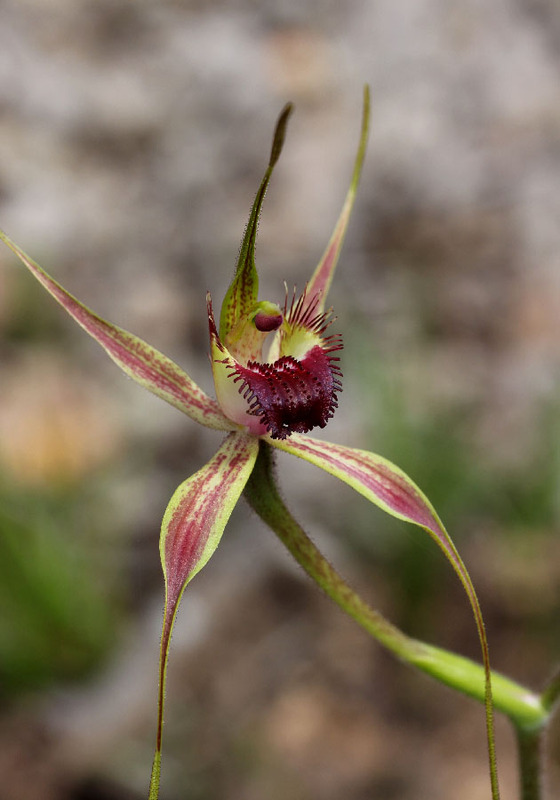 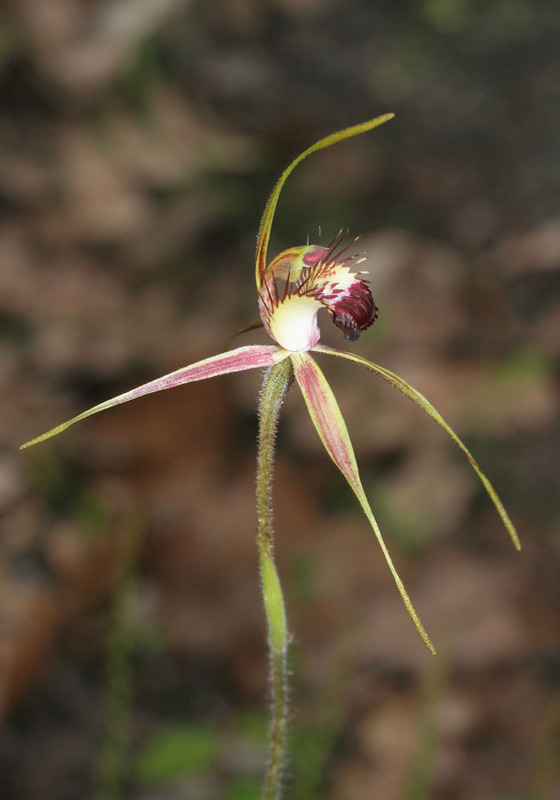 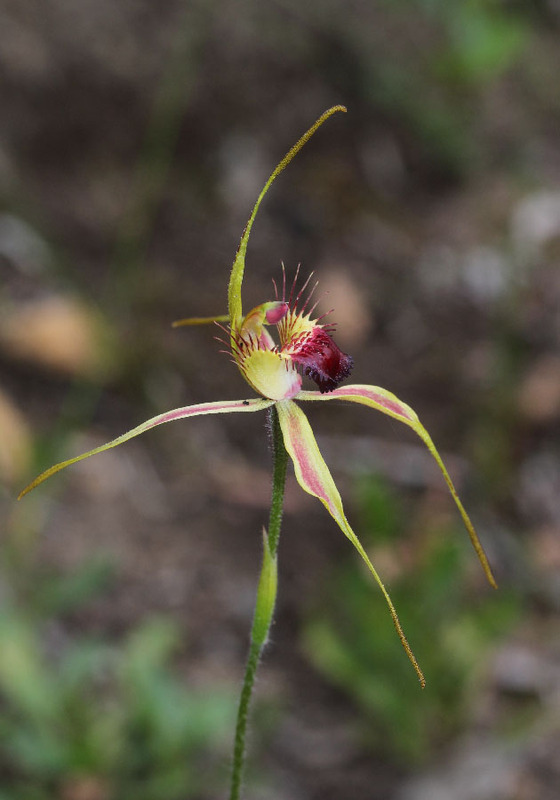 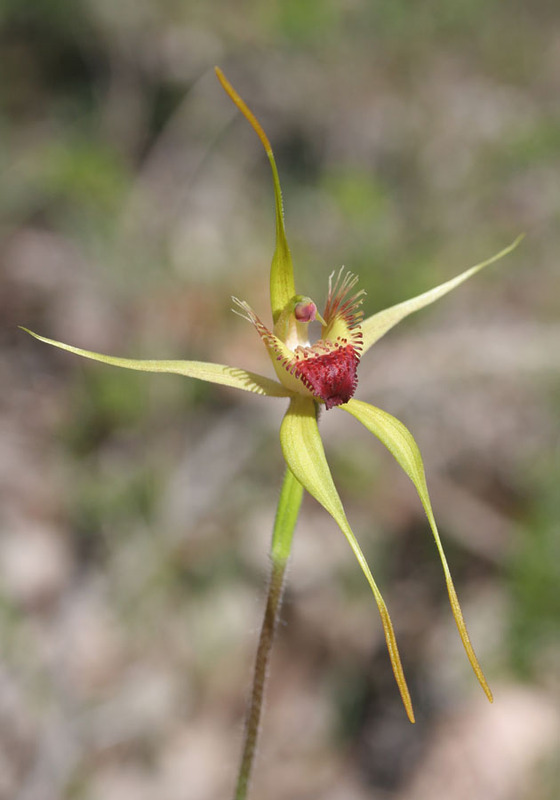 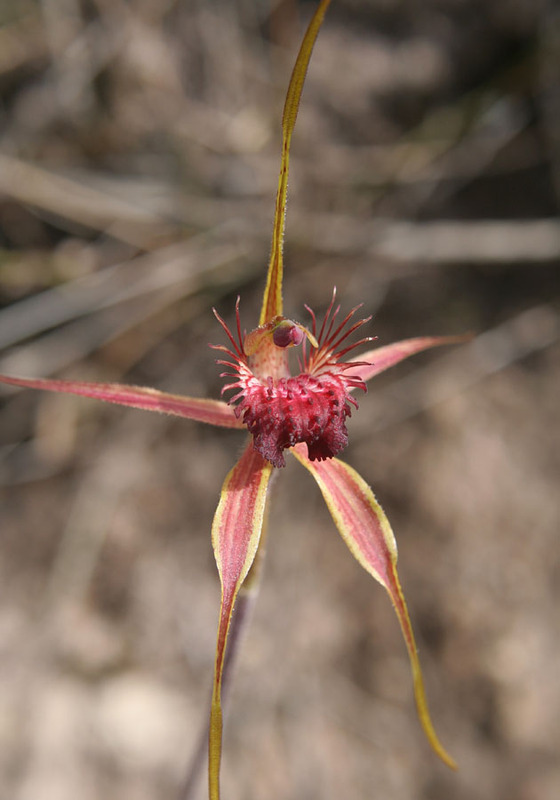 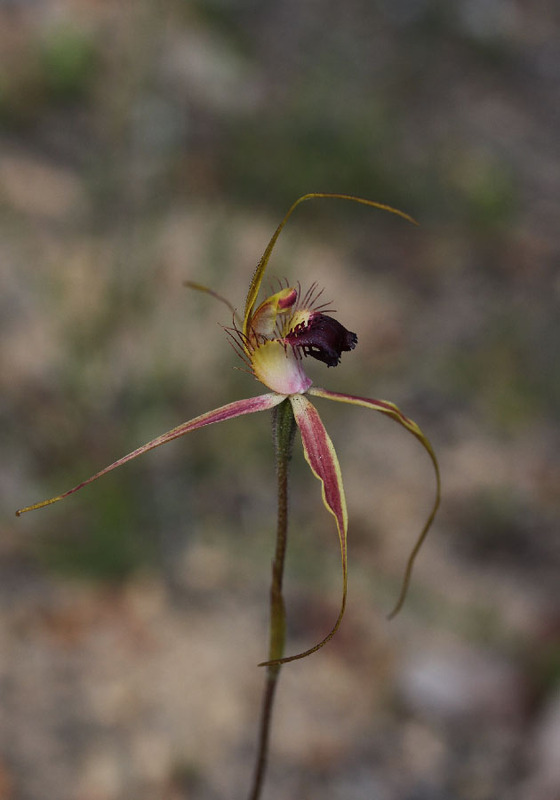 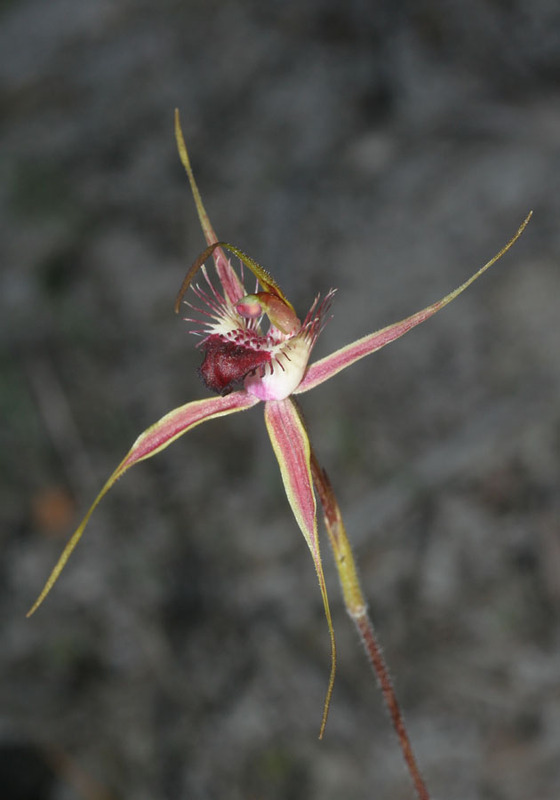 It is similar to the King Spider Orchid, but differs in that it does not hold its petals stiffly upward and is usually not as brightly coloured. 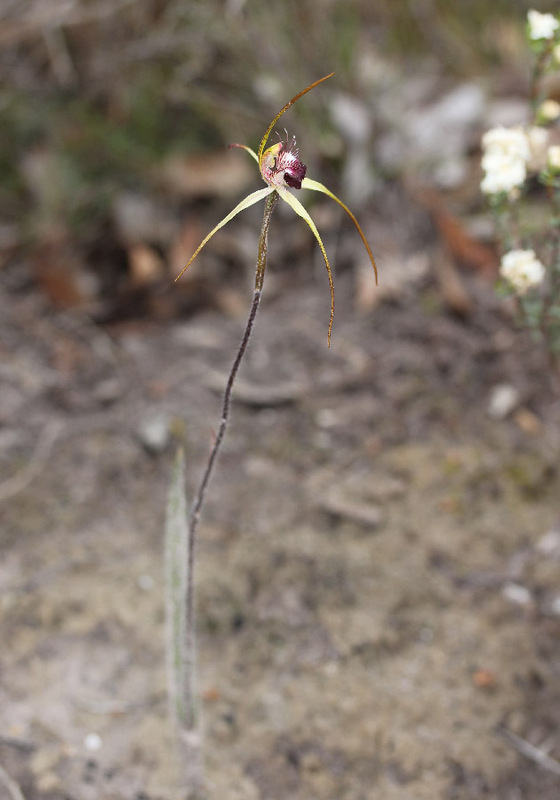 The Karri Spider is distinguished from the other species in this group by its shorter petals and sepals. 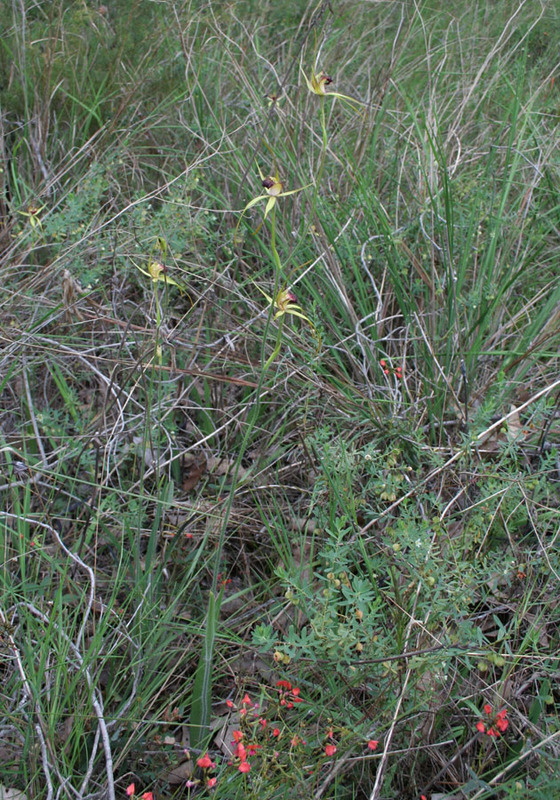 It flowers a bit later, from late September to October. 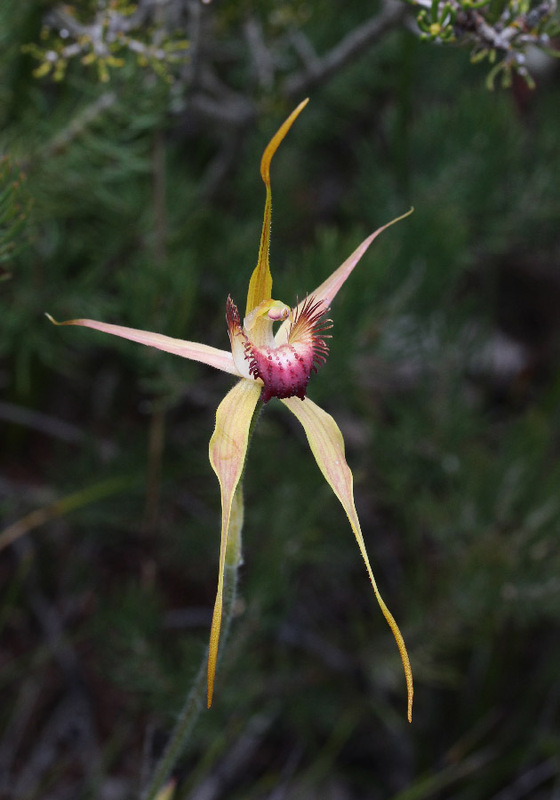 It is found mainly in the lower south west in a variety of habitats, usually forests. 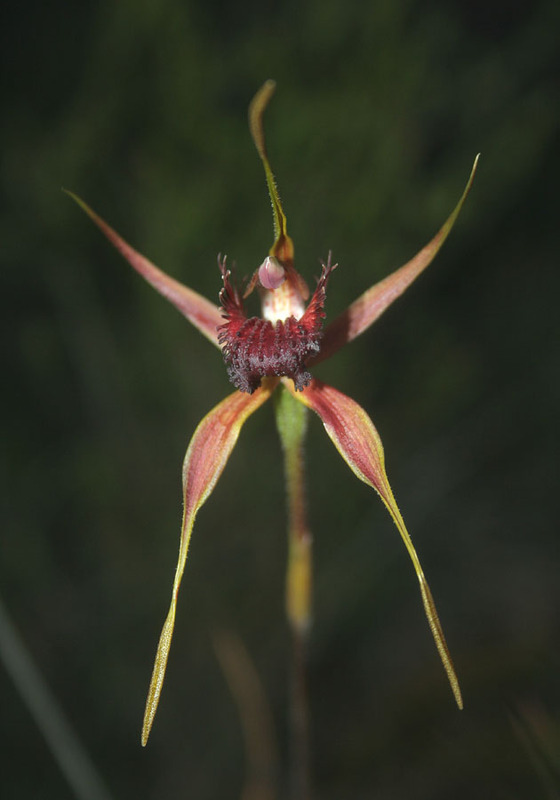 The Carbunup King Spider Orchid is a variety of the King Spider Orchid. 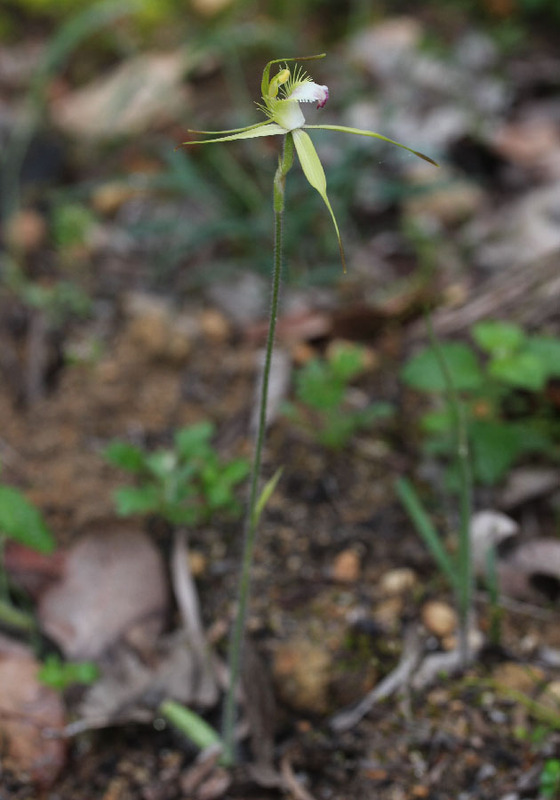 It is distinguished by the yellow colouring and considerably taller plants. 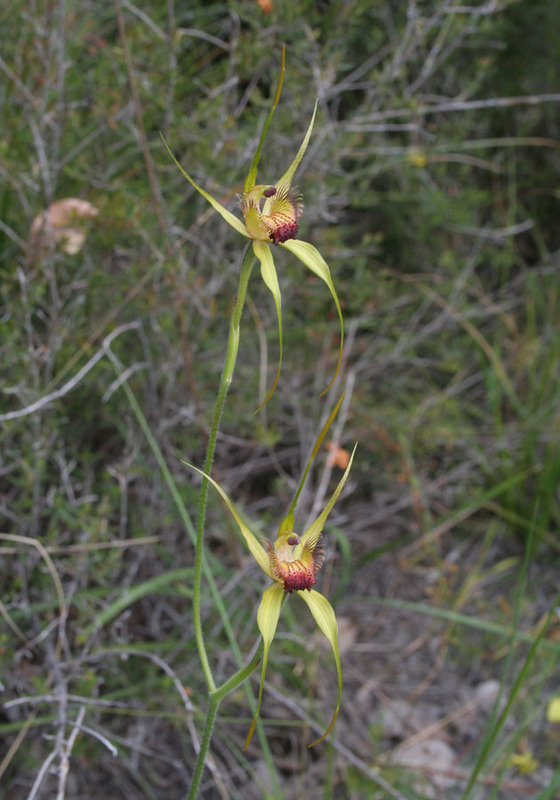 These can reach up to 1 metre in height with three flowers. 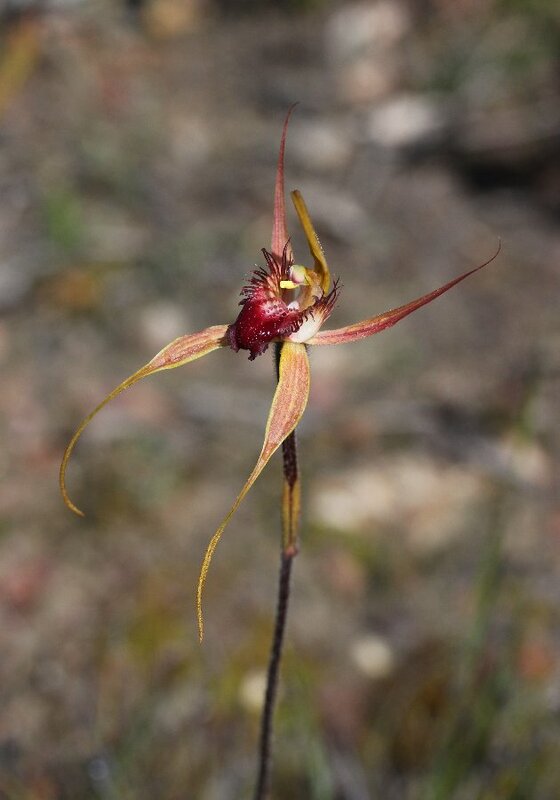 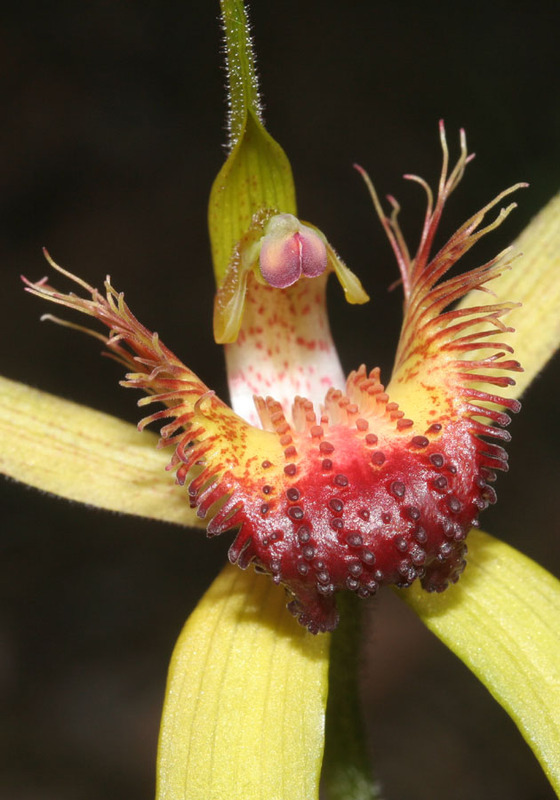 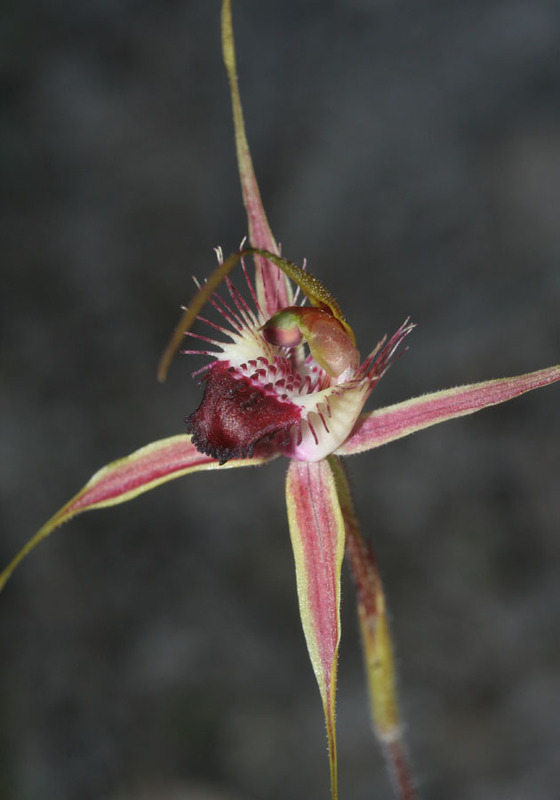 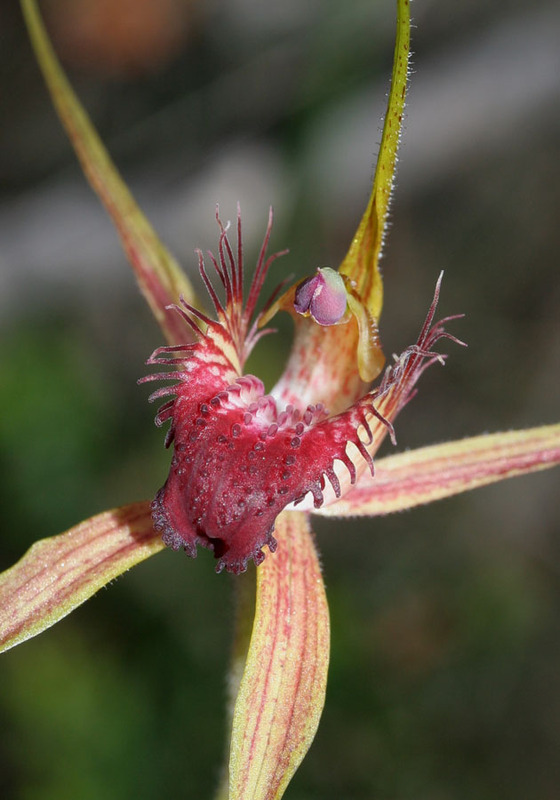 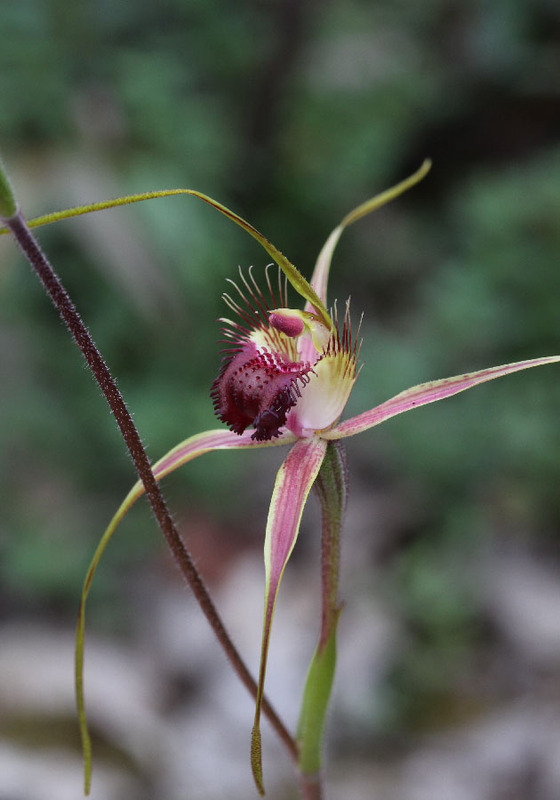 This orchid shares the feature of stiffly held petals with the King Spider Orchid, Caladenia pectinata. 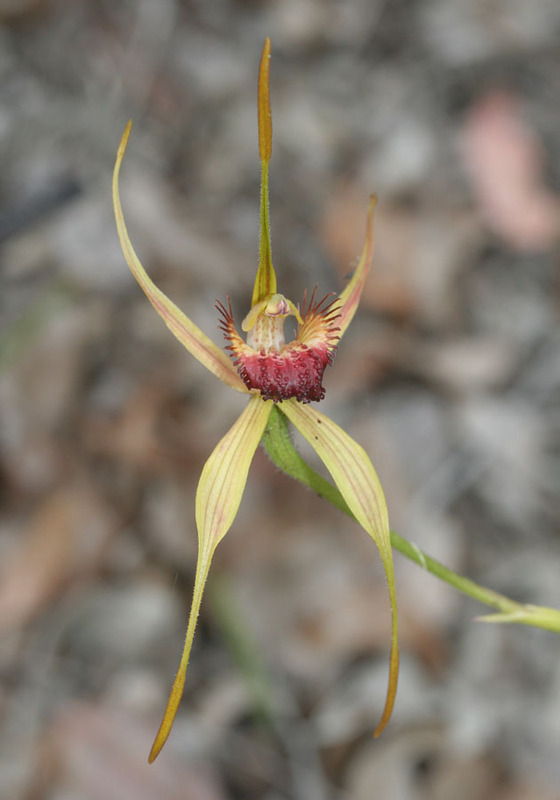 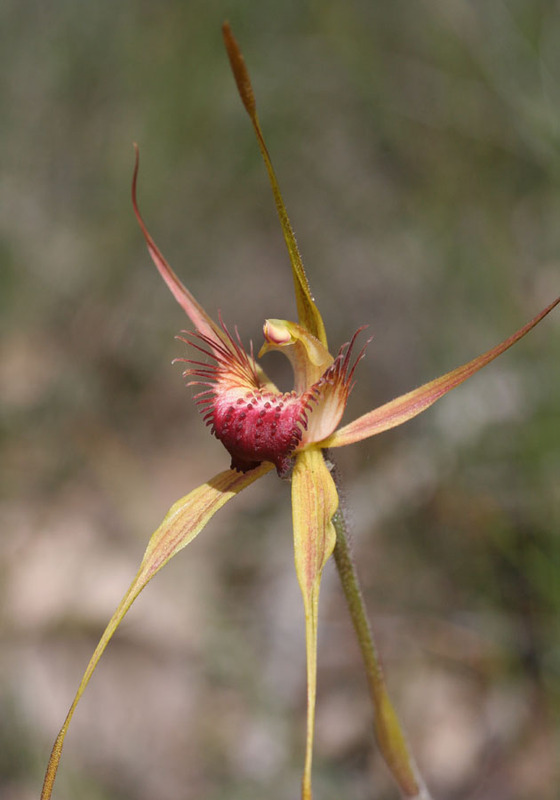 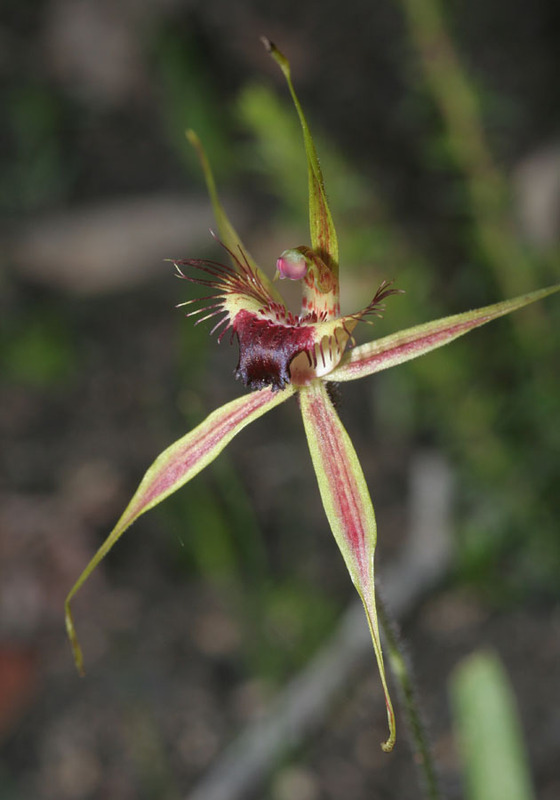 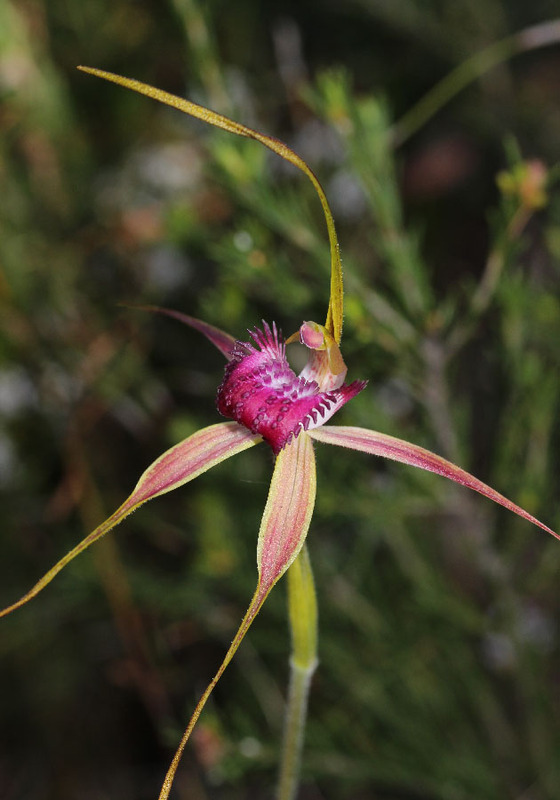 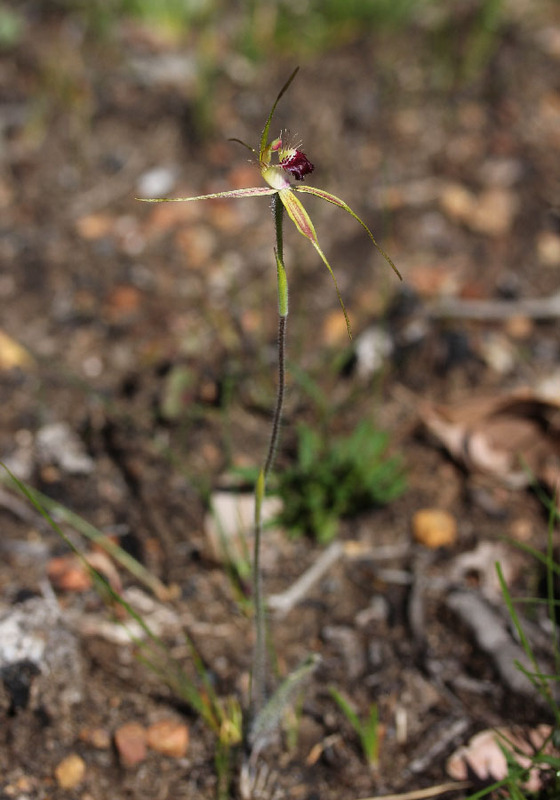 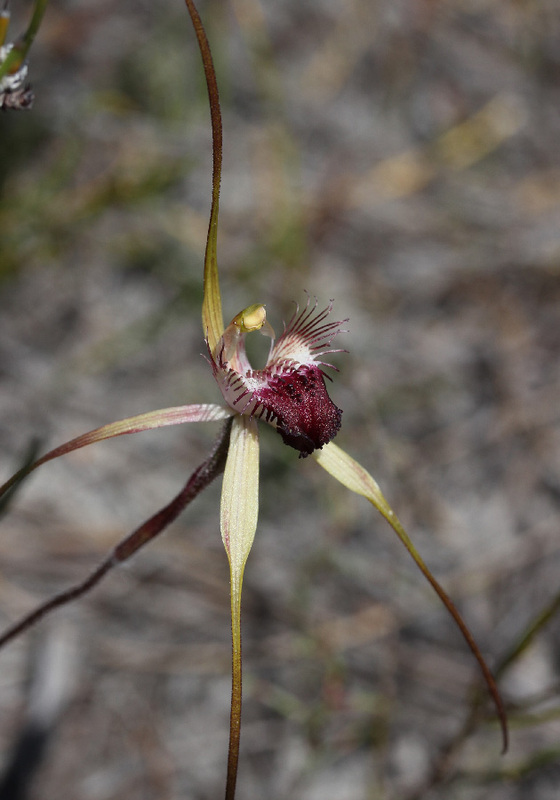 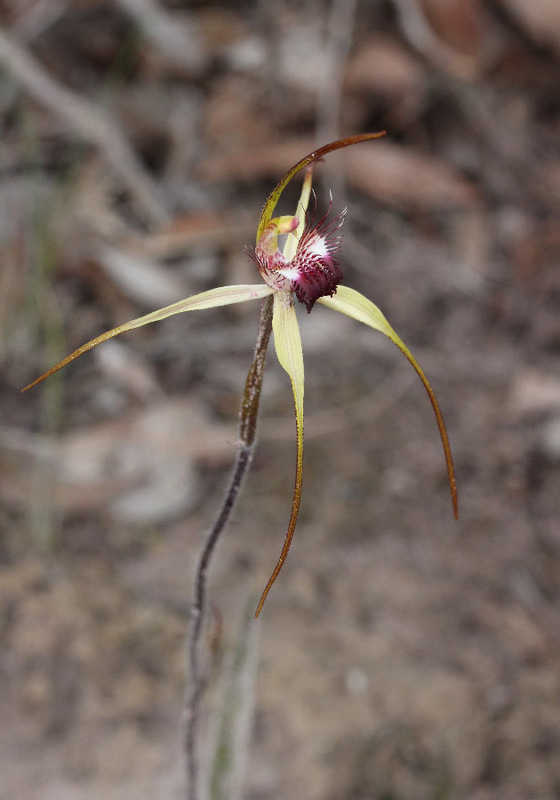 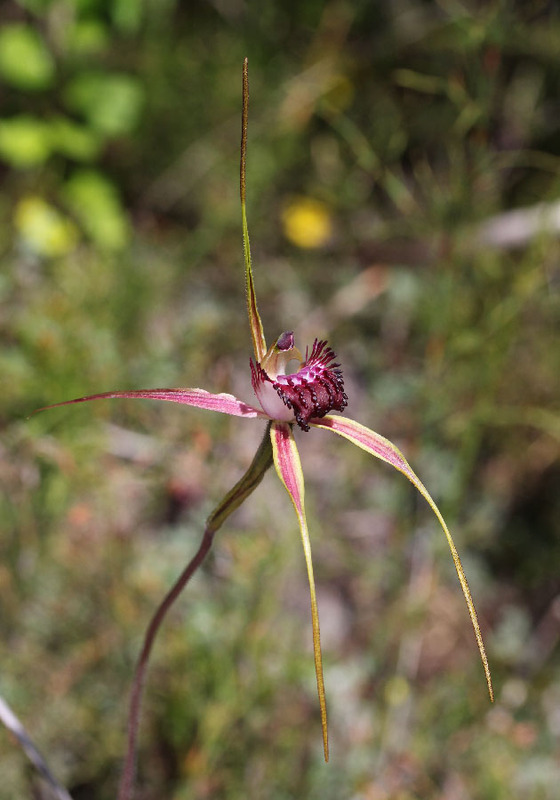 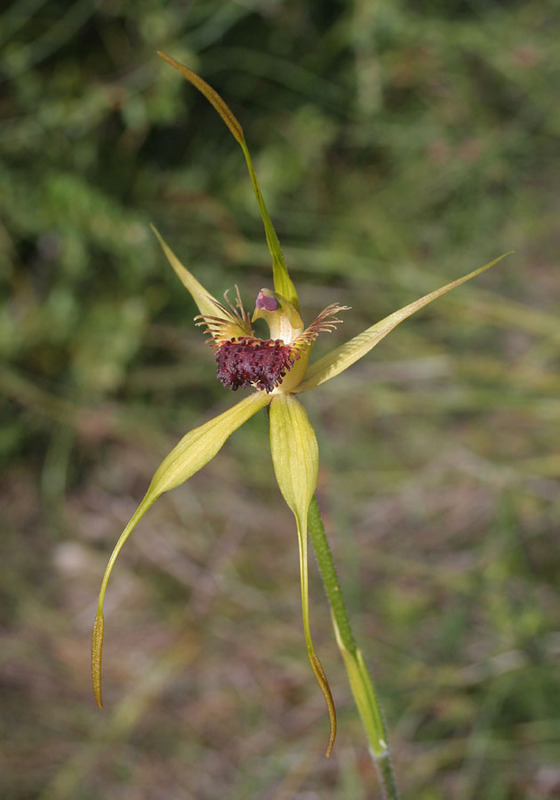 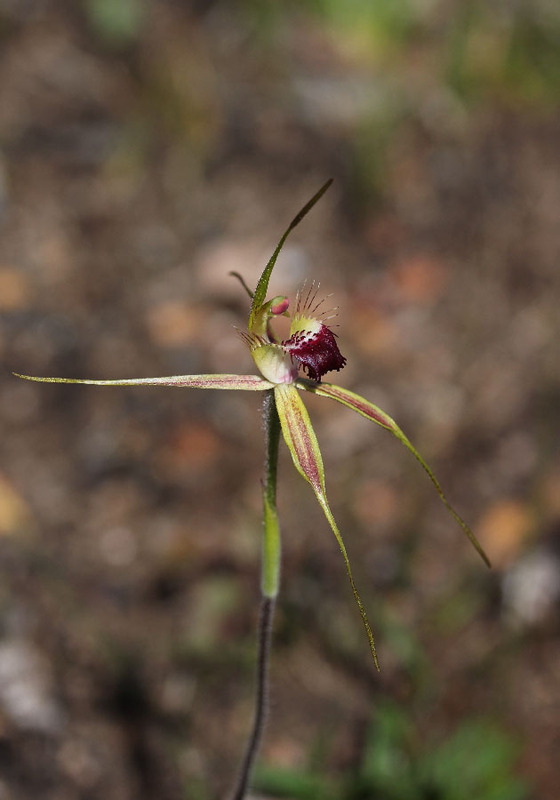 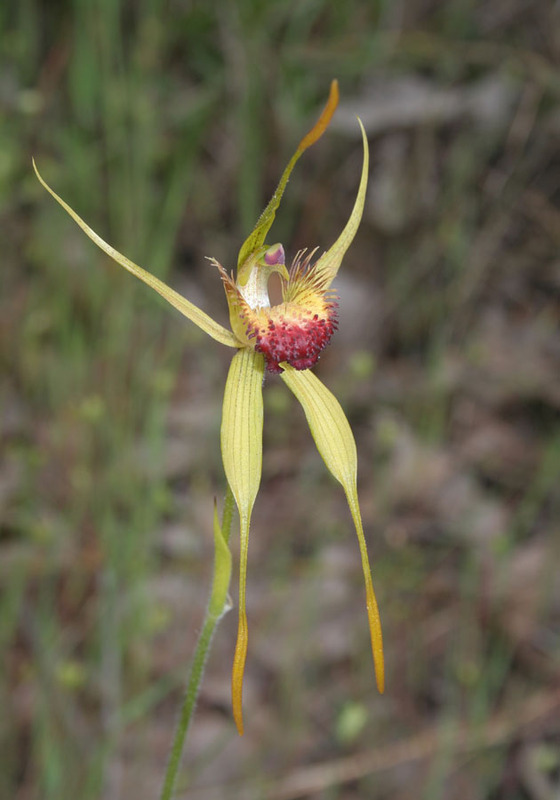 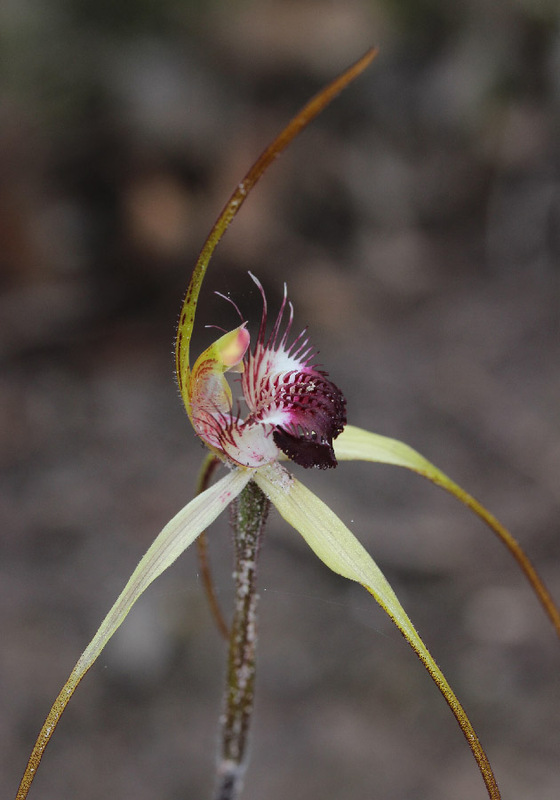 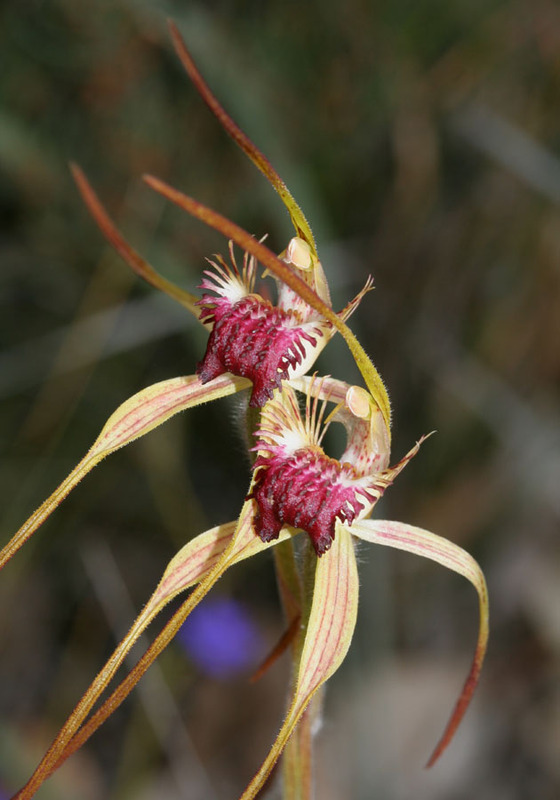 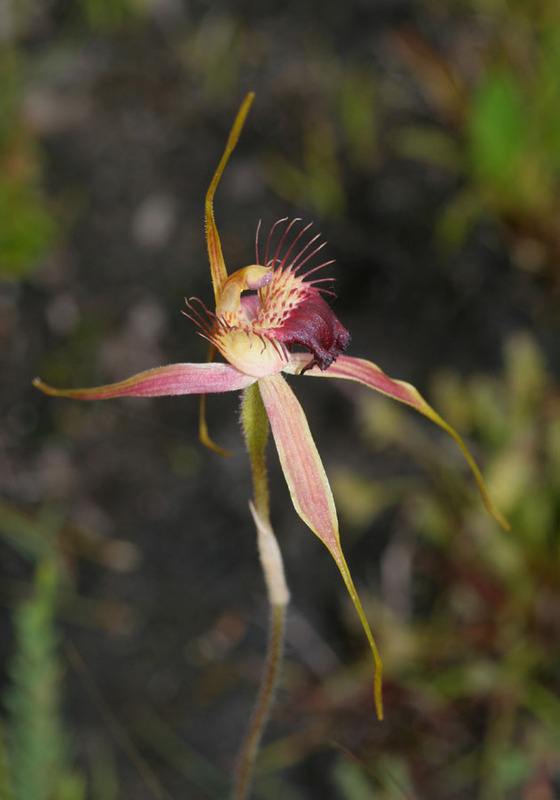 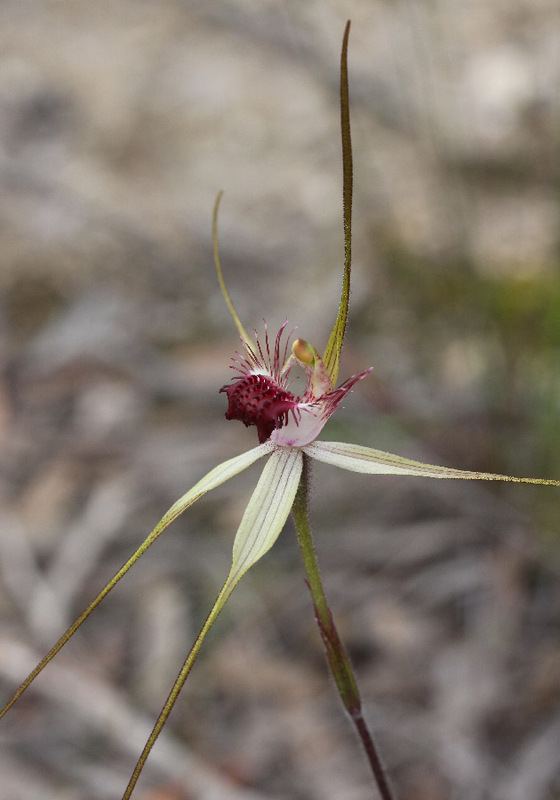 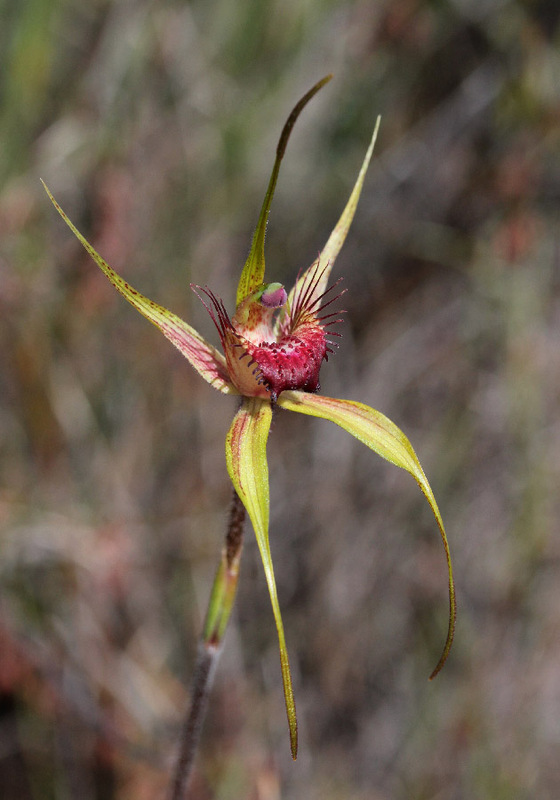 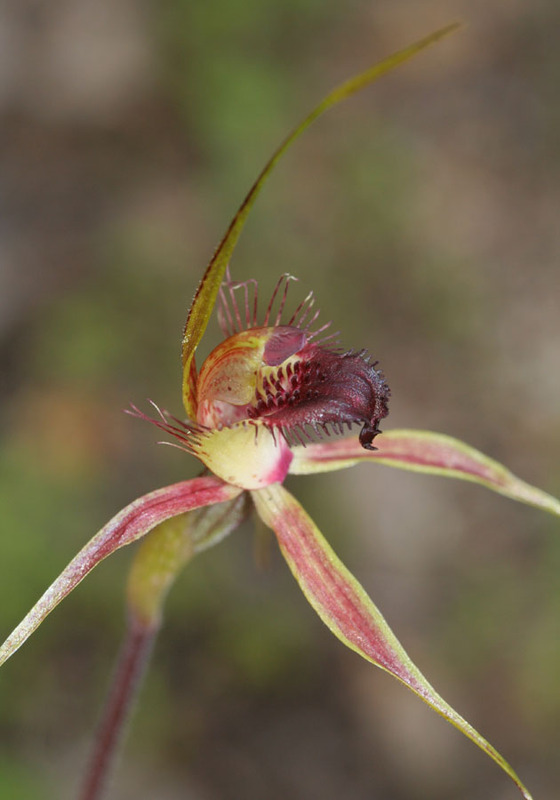 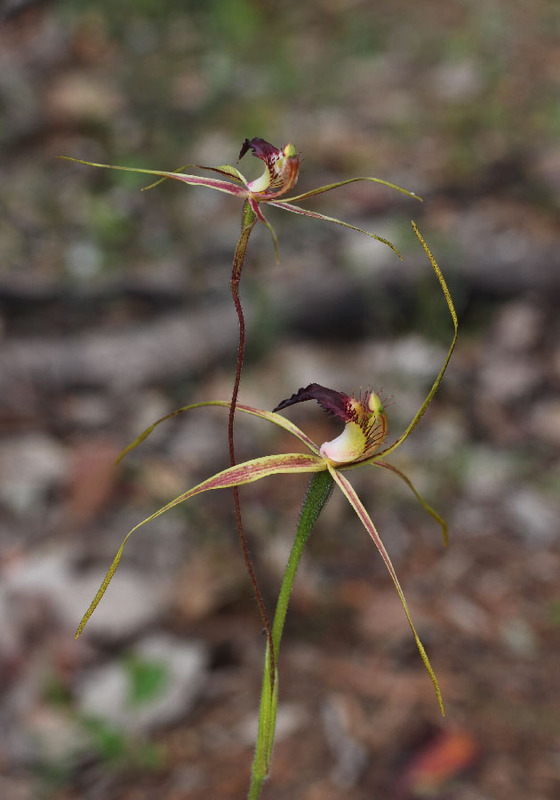 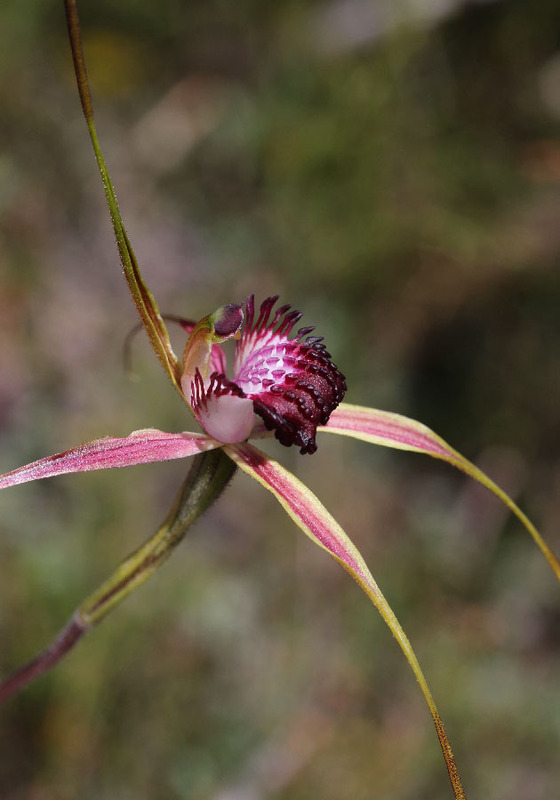 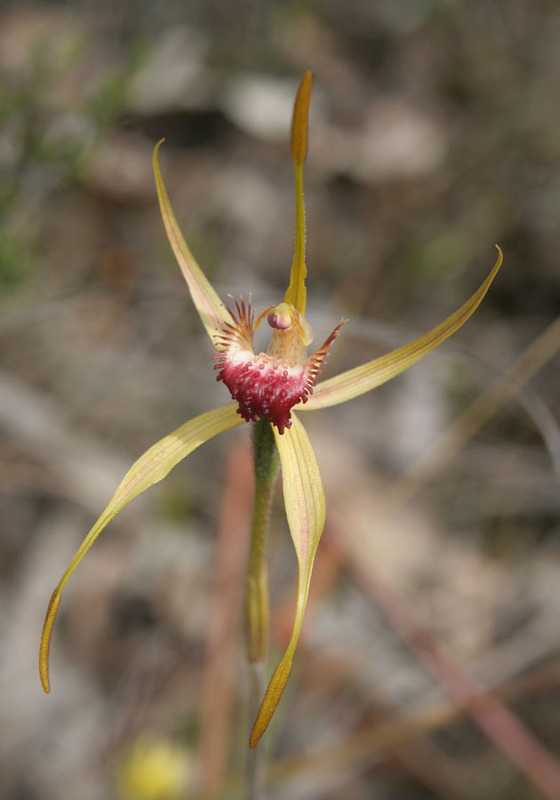 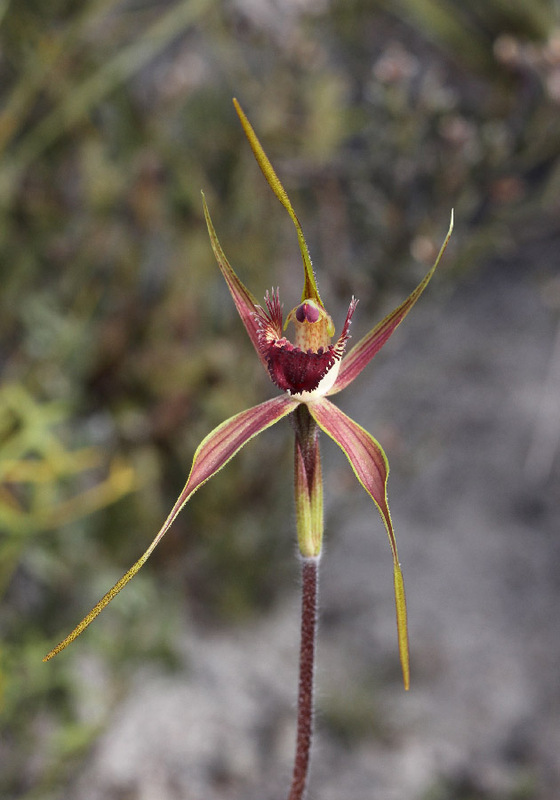 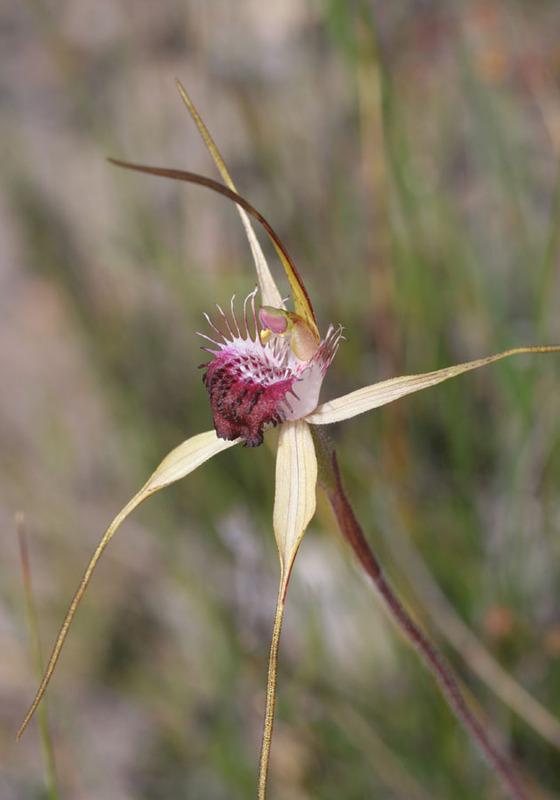 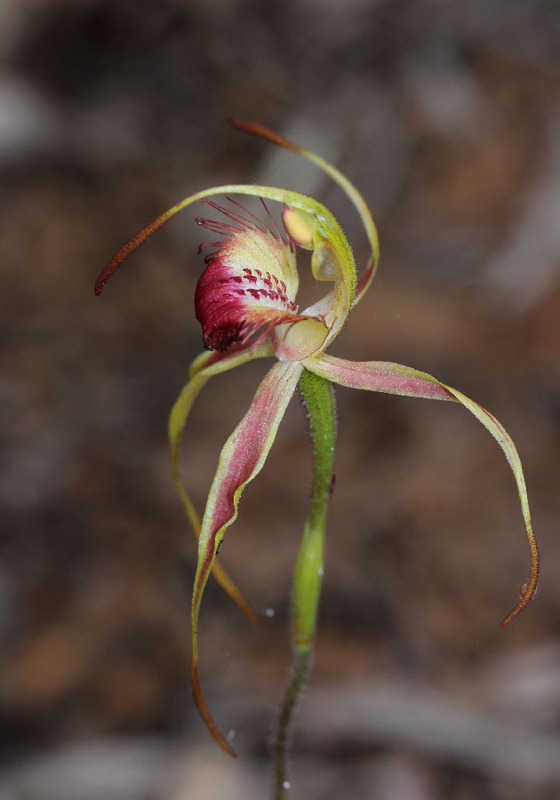 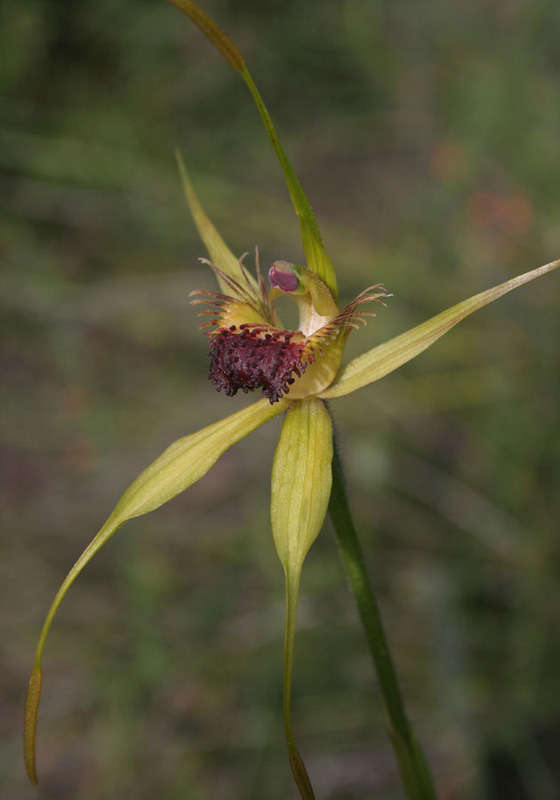 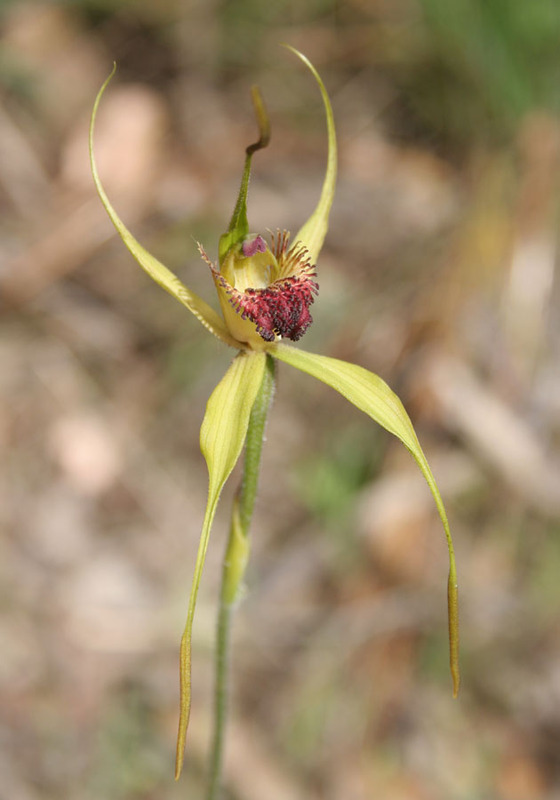 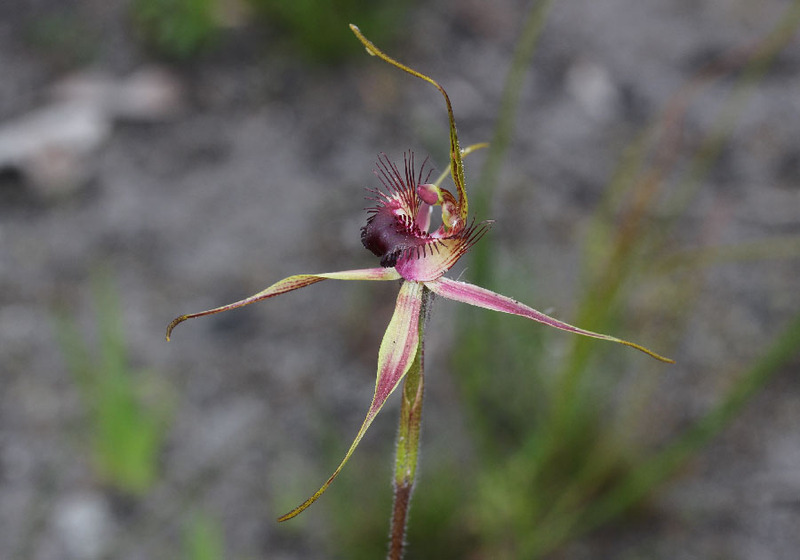 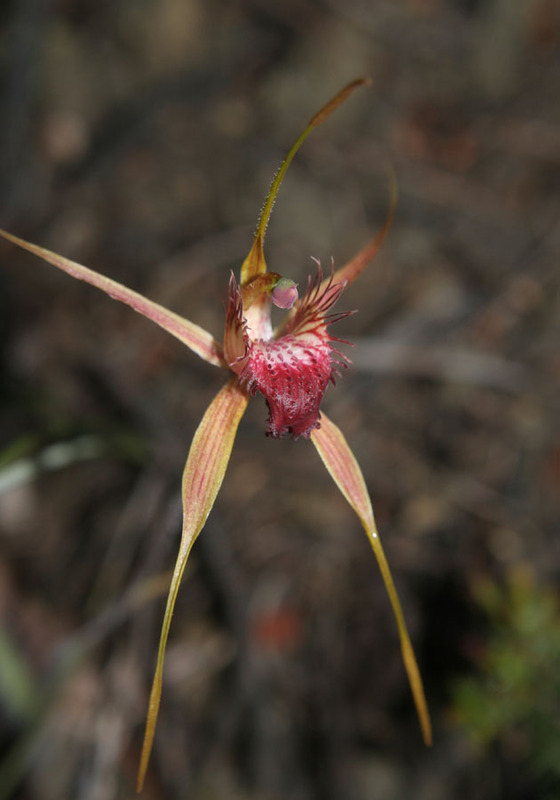 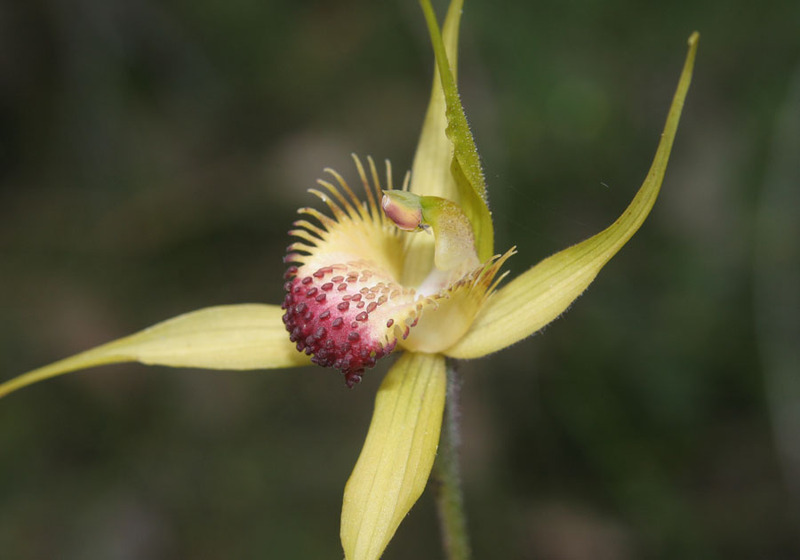 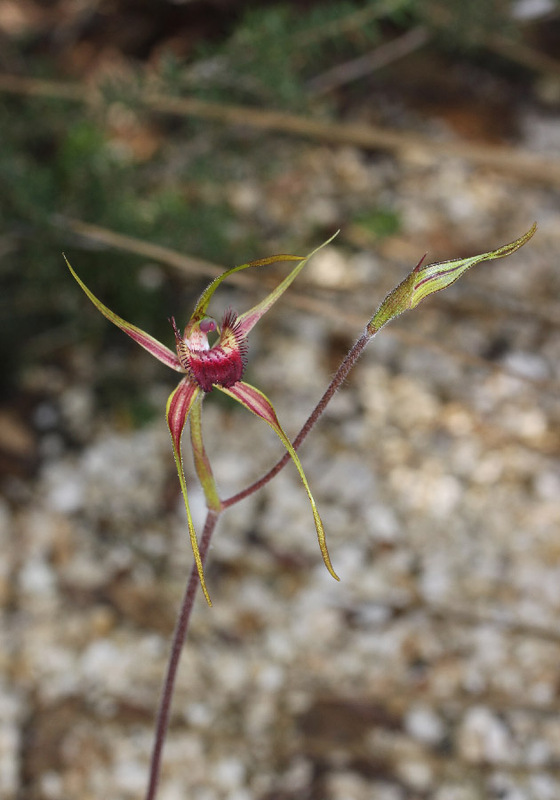 The Carbunup Spider Orchid, while locally common, is not widespread and is listed as Threatened Flora. 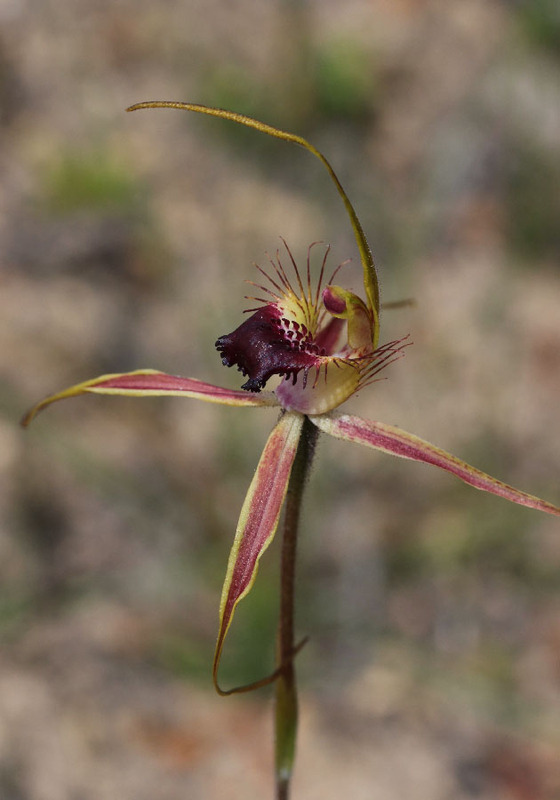 The Broad-lipped Spider is identified by the very short labellum fringing. 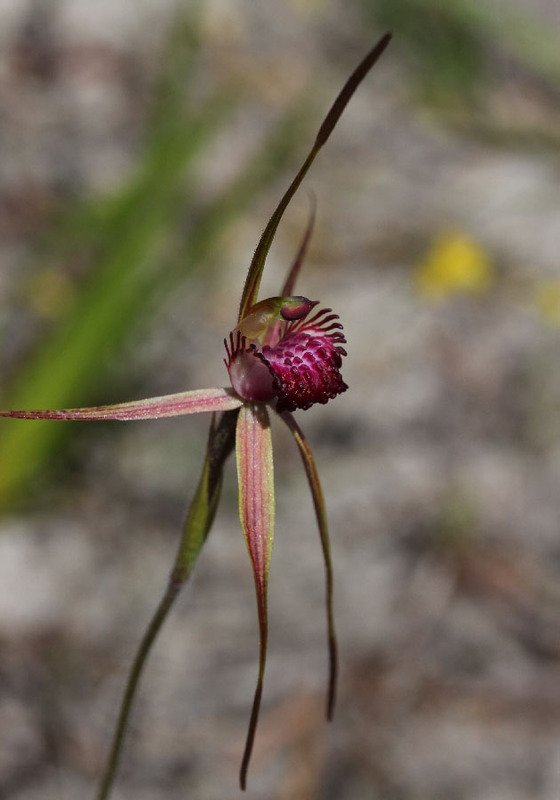 It is found in coastal areas between Busselton and Albany. 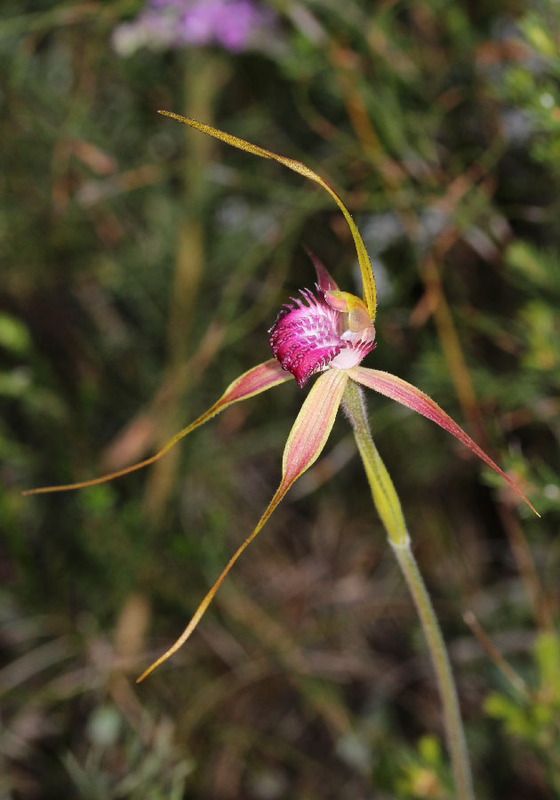 Apart from the short labellum fringes, the spider is rather similar to the Karri Spider and the Swamp Spider Orchid. 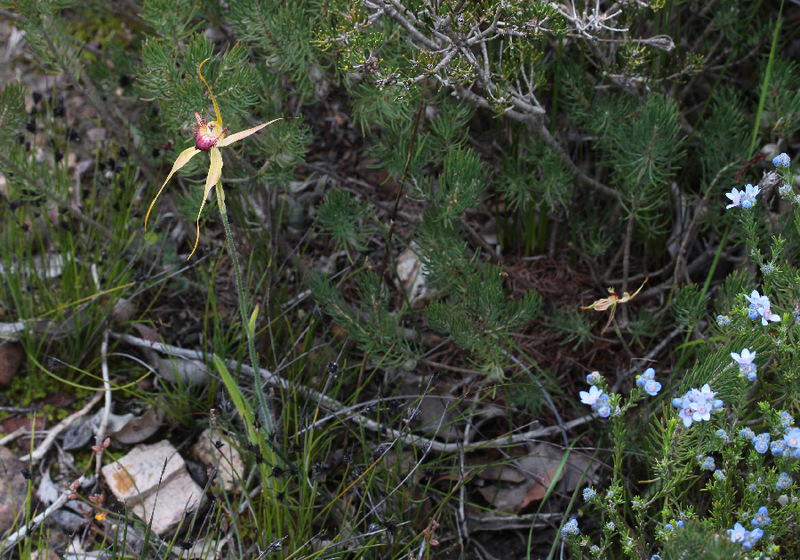 The pinkish tinge on some of the flowers pictured here may be due to some hybridisation with nearby Cherry Spider Orchids (C. gardneri).